Game development has me a Little Bit Lost! I start planning out a game about 10 months ago and was really enjoying survival voxel games at the time. As a small time game developer I was starting to play games with more of an insight into how it all works behind the smoke and mirrors and often would love working out how something was done. This is how I got interested in the idea of doing a voxel based game and at the time (and even now) there is a biblical flood of zombie survival games on the market, so I needed some original idea that was unique yet still was a fun and interesting experience for the player. Having been a fan of “Honey I Shrunk the Kids”, books like The Borrowers and even the shenanigans of the “Toy Story” franchise I was really interested in taking my game development to a smaller scale. So I started thinking about a science experiment gone wrong and you wake up to realise that you are a “Little Bit Lost”. A large portion of the work I have done over the last few months has being to build a voxel system in Unity which I have now got working quite well, have optimised, integrated marching cubes to smooth the terrain, added in separate cubic style voxels and am currently working on getting it all networked. Being an Australian developer I want to include a lot of Australian inspired small scale creatures and already have a very interesting list of insects, bugs and creepy crawlies to challenge players. When you are Australia everything can kill you. When you are tiny in Australia you don’t stand a chance! I recently have worked on one of the main non player characters that will be encountered in the game and that is the ant. 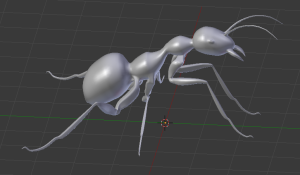 He is going to be based on the Australian meat ant and will be a very interesting adversary for players of the game. I hope to regularly post updates about my development progress and hope that people will soon enjoying playing “Little Bit Lost”.